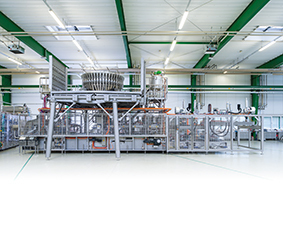 One leading player in high-speed pouch filling machines develops and implements processing facilities and pouching machines that are used primarily in the food, beverage and pet food industries. These industries have extremely stringent hygiene standards, which necessitates efficient cleaning of the systems. The components used in the systems therefore have to withstand not only harsh production environments, but also chemical cleaners and splashing water. That also applies to the pneumatic fittings used in the wet areas of the filling machines: even if these components do not come into direct contact with the products, they are used in processes with high requirements for hygiene and are subjected to rigorous cleaning procedures. Among other things, this has consequences for the material used: nickel-plated components provide sufficient protection against corrosion as long as the nickel coating remains undamaged. But they cannot withstand the environmental influences that filling machines are exposed to – which soon becomes evident in the occurrence of pitting corrosion. Stainless steel fittings are less sensitive in such environments, since they feature high resistance to corrosive influences, even without a coating. That is why the manufacturer chose fittings from Series 17 of the Eisele Inoxline. Made of stainless steel, they are designed for durability to withstand both a vacuum of -0.95 bar as well as pressures up to 16 bar for a long-lasting seal with no leaks. Wherever vibrations and tube movements occur in the production environment, the connections are supplemented by the use of threaded fittings with a union nut. This prevents uncontrolled release of the tube connection. Due to their high-quality material, the stainless steel push-in fittings are an ideal choice for connecting pneumatic control lines in the wet areas of filling systems. The fittings combine reliability and durability with optimal hygiene. They are designed to meet very stringent requirements with respect to cleaning and corrosion resistance. A broad temperature range from -20 to 120°C makes them quite versatile, and suitably designed fittings can even withstand temperatures from -50 to 200°C. Series 17 components allow the full flow rate inside the tube despite their compact design. The fittings enable very fast connecting and disconnecting of compressed air tubes without the use of tools. The screw-in end for mounting the push-in fitting on the machine or process valve is sealed with an enclosed O-ring. The tube only has to be pushed fully into the release sleeve of the push-in fitting. The collet inside the fitting holds the tube in its position for a lasting, reliable connection with no damage to the tube. Even in the case of frequent connecting and disconnecting – for maintenance purposes, for example – the collet prevents damage to the tube and ensures a tight seal at all times. All it takes to disconnect the tube is to press on the release sleeve. This convenience of handling was also important to the manufacturer of pouch filling machines. In the past, push-in fittings from a different source were used, and the manufacturer was never quite satisfied. Insertion of the tube, for example, required considerable physical force – and releasing the tube was even more difficult for the most part. The reason for this is that many fittings available on the market have no release sleeve, only a release ring. It has to be pressed with considerable force, which is not only manually difficult, but also bothersome in the long run. The use of tools, especially in the case of plastic release rings, can easily cause damage to the rings, which makes it even more difficult to release them. Not with Eisele fittings: the large release sleeve requires only little physical force, and enables convenient disconnecting of the tube even after an extended period.